Cегодня, 12 марта, стало известно, кто из Молодых Львов победил в каждой из 5 номинаций Национального отбора Young Cannes Lions'19. И, соответственно, представит Беларусь в конкурсе на Каннском фестивале рекламы этим летом. Напомним, что конкурсное задание от фонда ЮНФПА было следующим: призвать белорусов не оставаться равнодушным к насилию над женщинами. 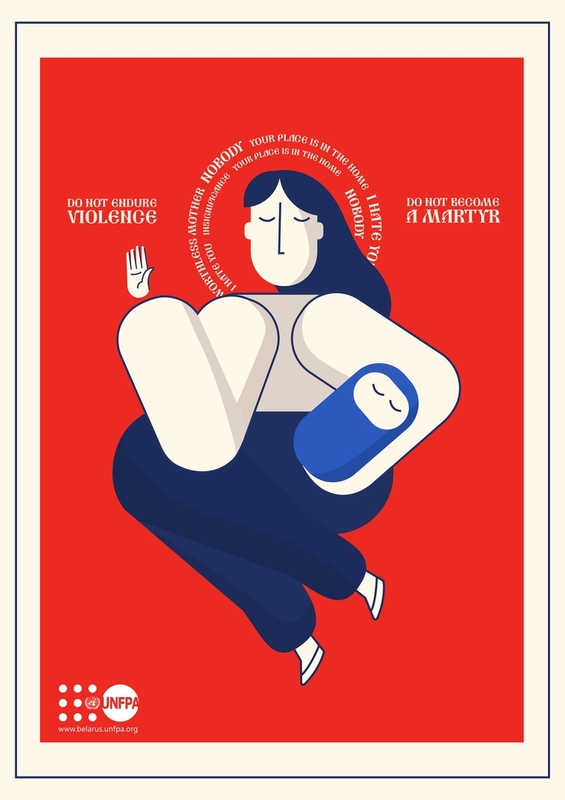 Тема компании, тэглайн звучит так: No silence for violence. properly crafted. wish it was less generic. contemporary approach, there is insight; sometimes women are like frogs. Boil them in water that gets hotter and hotter, they will miss the risk point of the temperature level. Using the app, it s a wake up call for them – enough is enough. clean execution, good call for action, one can see the road from a visual statement to an action to be taken. The idea behind is fluid, yet the final look is not very original. Simple and powerful Icon. Great work! Probably the best idea in Design. Congratulation for this different approach for such a hard topic. I really love the simple and positive approach. With this design I get the feeling that UNFPA can really help me. Perfect. Boom. I saw it and I said – yes. That’s it. So simple yet tells the whole story. One of this cases that make you wonder how it wasn’t done before. It’s a smart design, seeing it tells a disruptive, broken story. It’s disruptive enough to make you feel uncomfortable even if you know nothing about the theme, and yet very aesthetic. Good idea, but a little obvious. I expected another layer of creative over it. Simple, elegant and versatile solution, which works great for a multitude of purposes. 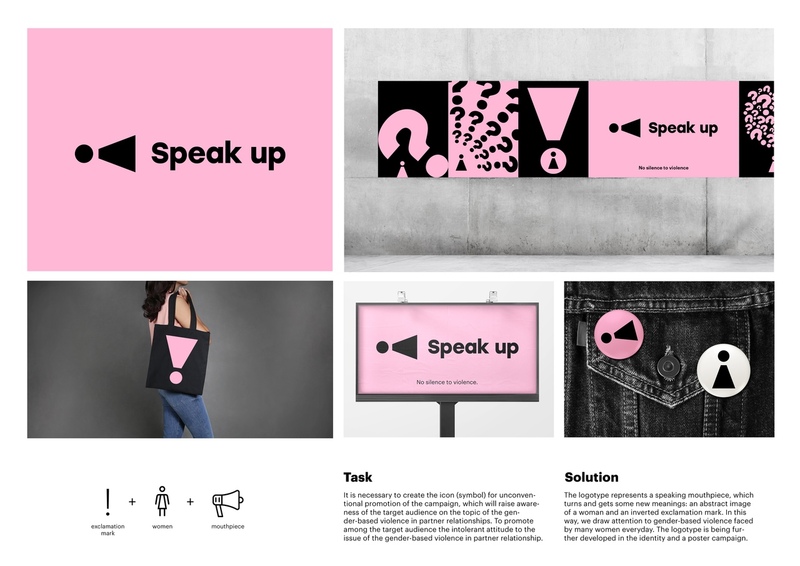 The representation of a sound wave as an opposition to silence is a simple, but effective and visually engaging approach. A combination of symbols and meaning that delivers the message in an interesting way. not sure you will ever be able to do such a thing. but… well… if you ever could it would be nice. though you can’t. but the pdf is nicely crafted so it makes me believe you. the insurance could be a good stunt. but only as stunt. failed to really understand what would make me download an app, but the event could be pretty immersive, which is cool. brilliant, outstanding. You should contact tinder and make it happen worldwide. Bravo. Nothing very innovative, many ideas that have no strong connection between each other. Too much text, a presentation should be more concise, focused and interested in result. hear me too – creative in approach, beautiful visual execution, but inefficient thanks to the lack of refinement. Think that some people are not perpetrators, also that they might be aware of domestic violence – hacking personal asistants might be a nuisance and by doing this, you are missing the point. People would like to avoid anything that is not fit to their work / household purpose. „Hear me too“ is a brilliant and unique way to use voice assistants (which are stereotypically all named after women and have female voices) to raise awareness about domestic violence. Its creative use of voice technology will definitely be able to generate PR and raise awareness about a critical early phase in domestic violence. There were only three entries, and I do not think that any of the other two entries deserve either Silver or Bronze. The idea of contract and insurance for relationships is good and interesting. Must say I didn’t fully understand the entire flow of the campaign. Sorry, the other two ideas – are just not good. 01 I didn’t understand at all, 02 is just not good enough in mt opinion to any lion. It’s too plain and annoying, only will make people annoyed about the cause and get the opposite effect. So I won’t grade them. beautiful idea to turn private into public issue through creative reinforcement to legally-based activities. I’d recommend to focus on one activity for public, so that message remains clear till the end - i.e. pick up insurance agency and introduction of marriage oath as part of the legislation. that’s a good insight you have there about the facebook videos - on mute. keep everything much more simple the next time! just make it shorter and concise the next time! insightful, simple to use, cultivating empathy. The only question – would people stop to use? Very smart! Not only it’s creative, I can actually see how it really works. It takes an embarrassing subject and forces people to talk about it. It’s great. Voice products are a rising trend and this one is a very smart solution, because it’s not a gimmick. It’s smart, very useful, long living and organic in people’s lives. It’s theoretically very strong, but from long time experience, medias like Instagram don’t just change their interface for campaigns. I don’t see how it happens in real life but it’s still a good idea. „Belmarket Shield“. This is a very interesting „product“ idea, which understands the core target audience’s needs thoroughly. „Where are you going?“ „To the shop. To get some air (help)“ brilliantly captures a typical scenario in a daily domestic violence family. At the same time, the brief is inspiring enough but not „suffocating“ – the agency will be able to see that the product will definitely need a creative way to communicate about the product in an intelligent way, which poses a great communication challenge and therefore is an excellent brief. 04 Absolut. „Love shouldn’t hurt“ is a great claim, which could possibly be variated in creative ways to position Absolut as a brand that stands against domestic violence. The brief is well thought out and clearly presented in beautiful design, which is inspiring. However, the role and scope of the agency’s work feels too small or narrowly defined – even though it could have given the agency a lot more creative room to experiment with the core idea. Voka. The brief is very well organized and cleanly communicated. The basic concept is interesting, however the combination with having to introduce new subscribers feels too forced and kills the authenticity of the campaign. Amazing idea, based on a very good and string insight. I think such a service should genuinely exist. Interesting idea. Execution is good, the insight is good too (even though it compares women to cars, which is always a bit problematic). I think the card challenge is good in theory but not perfect (it’s complicated, forces me to be active every day, which people aren’t, and too noticeable around the house). To be honest, I’m not a big fan of this idea, I think it’s plain and a bit superficial. Expected from an alcohol brand to be brave enough to point the connection between alcohol and abuse. They didn’t. the sleeve is nice (interactive videos are an old and boring gimmick), but the only reason I’m giving it bronze is because the other ideas in this category are worse, in my opinion. I believe it is the most clearly stated brief in terms of creative task, product name and clearness what’s next for the agency to do. great correlation between client’s business and the topic of domestic violence. Well stated strategy and new product ideas. It needs a little bit more structure in the execution details, however, the brief gives a good foundation for the creative agency. monitoring the violence through a period app. Smart, discreet, efficient, lucid perspective. athletes wearing painted bruises to make everyone talk about the problem. Splendid idea, perfect timing, but there are 2 comments – what if the athletes ask for money or refuse to join? Just the talking, but very clear direction about doing is not enough. Using a period tracker app as a media for domestic violence victims is a great idea that is also feasible. It also links very well with the core insight from the team, that domestic violence tends to be a vicious „cycle“, and women tend to not realize that they’re victims until too late. „The Violence Starts So“ is a well thought out claim. The technical feasibility or the actual impact it would have by targeting the perpetrators (and not the victims) is not clear enough, however it could be a creative way to raise awareness among males. The idea to catch couples when they’re at an early stage and to combine that with IKEA was brilliant – however the implementation could have been better thought through, to make it less feel less „negative“ – otherwise an actual collaboration with IKEA would have been never possible. WOW!!! What an idea! I want the team who created it wo work for me. Interesting idea, in an unexpected place. I think the graphic execution can be better – especially if were talking about Ikea, the masters of Nordic design. It’s an interesting media, but I must say I’ve seen messages like this before in doctors’ offices and health centers. The use of media alone is not enough, I think the message should be new as well, to make it different from any other sign in a center. - it’s actually pretty stupid but somehow it got my attention. so i guess it worked. not sure what to do next, but at least got my attention. - I actually like the first one, the one where the lady seems to sink because of the word (insult). it’s nicely crafted and the message is pretty visible. clean execution, memorable idea, I loved the humor – in those matters sometimes being didactic is being useless. By having this humor touch you grab the people by the eyeballs and make them think beyond the very first moment they saw the ad. Gold – Team #13 It works. It gets your attention, you understand it and want to read the copy. The combination of the image and headline is just great. I really liked the execution. It popped into my eye and got my attention immediately. Well executed. Great Headline. Honest and empathic insight. Good insight with good execution. Notice there’s a mistake in the English copy, it’s supposed to be “Words kill” and not “Word kills”. I ignored that because of the beautiful execution but Cannes judges won’t. the best insight. It’s strong, because it’s an exaggeration of a situation that’s so common it’s almost a cliché. Great concept, but the visual execution could be better (looks too photoshopped, no shadow etc). Good insight, noticing the early warning signs. The concept of the hand “choking” the neck is good but could be done better, not sure it’s obvious enough. Visual execution could be better. The image and the copy sync together to hit the right strings and encourage the witnesses of violence to change their attitude. Strong image that doesn’t even need words to make you almost physically feel the issue. Nice use of social media references to expose a real-world problem. Strong and clear message.